Learn more about the manufacturing process of extruding plastic. Small pellets of low density polyethylene (LDPE) resin are uniformly blended with specific additives as required for varied product applications. These additives serve to enhance clarity and provide features such as strength, UV protection, surface appearance, slip resistance and other properties to produce best quality and precise outcomes for the many and diverse requirements of our clients. If the film is to be coloured, concentrated coloured pellets known as Master Batch are added in at a suitable ration to achieve different opacities and virtually any colour that you require. Once blended, the resins are fed into extrusion machines under carefully controlled conditions in order for the resin to become molten and pliable. The mix is forced through a precision die where air is introduced and a "bubble" is formed. This process is known as "blown film extrusion". 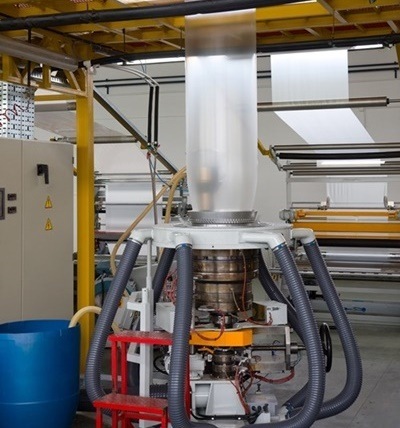 As the bubble is drawn up vertically, it allows for wall thickness and diameter to be adjusted and for the molten plastic to receive the cooling time required before the film is laid flat under tension onto cores and forming rolls of plastic film. These rolls may then progress through to the printing and/or the bag conversion process. If the product is to be printed, a customised plate is made for each colour required. They are mounted on to a cylinder and placed in the printing press. To make a complete picture, the image is transferred from each plate and has to register exactly with the images transferred from the other colours. A flexographic print is made by creating a positive mirrored master of the required image as a 3D relief in a rubber or polymer material. Flexographic plates are created with digital platemaking processes. The image areas are raised above the non-image areas on the printing plate. The ink is transferred from the ink roller which is partially immersed in the ink deck. It then transfer to the anilox roller and onto the printing plate in a uniform and even manner. The extruded film is fed between the plate and the impression cylinder to transfer the image. The newly printed film is then run through a dryer, which allows the inks to dry before the surface is re-wound onto a roll again. After the polytube is created, the rolls are reverse fed through specialized machinery. 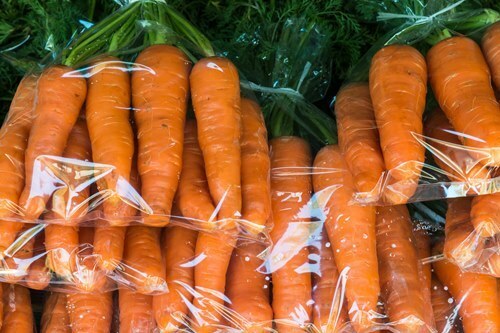 Depending on requirements, we cut and heat seal the rolls of polytube to create side or bottom seal bags, gusseted bags, punched bags, bags with die cut handles and many other variations. After precise conversion into bags or sheets, the products are packed into boxes and often wrapped on pallets for delivery to our customer. We are very proud of our reputation in producing a consistent and excellent quality product in a reliable and timely manner.